Spring has finally arrived at Toad Hole Farm! We’ve already welcomed 2 new calves in the past month, and they were jumping and chasing each other around the barnyard today. 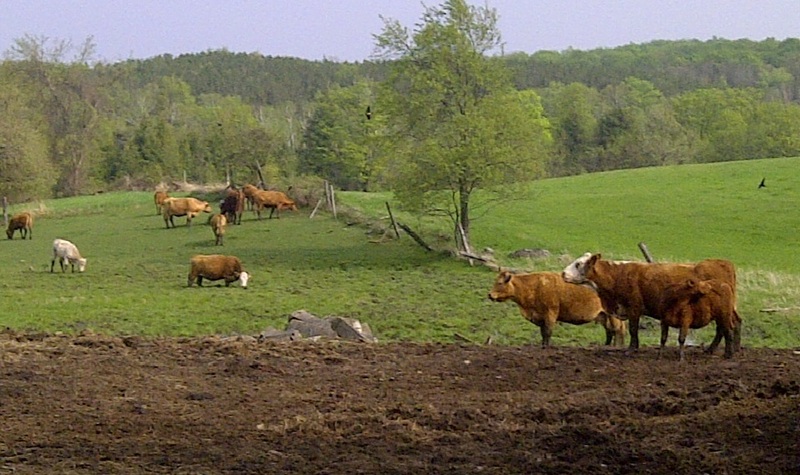 The pastures are green, and all the cattle seem very happy to be out in the sun (as you can see from this picture we took this week). We are looking forward to more WWOOFers from across Canada and around the world this summer! It’s been such fun to have them stay with us and learn more about their lives, as well as sharing some of ours. Last year, we had people from the Czech Republic, France, Germany and Canada stay with us. We are now taking orders for pastured chicken, and we still have some beef left for those interested in stocking up for bbq season. Enjoy the light and warmth! This entry was posted in Uncategorized and tagged Alliston, beef, chicken, Dufferin, farmer, grass-fed, Guelph, hamburger, local, Mulmur, natural, Ontario, Orangeville, organic, orgasmic, pastured, Toad Hole Farm, Toronto, wwoof by rebekahjamieson11. Bookmark the permalink.